Sharepoint backup software must protect shared data circulating via Microsoft Sharepoint product family, especially business-level data. With Handy Backup, you can save all components and stages of Sharepoint workflow, using both server and end-user data as simple files and folders. Besides using internal Sharepoint online backup and restore plans, which are the points to use external backup solutions to do the same thing? The answers are extra security, extra cheapness and extra versatility of your Sharepoint backup data. Store your Sharepoint snapshots where you want, from local and external drives to NAS/SAN units to FTP, SFTP or FTPS sites and to clouds including Amazon S3, Dropbox, Google Drive and OneDrive. Encrypt and compress Sharepoint information. Moreover, be informed of each operation with data! You will not pay for Sharepoint backup and restore operations with Handy Backup, except possible costs for network traffic and online storage space. Add your Sharepoint data to the total strategy of information backup on your PC or an entire network, including database, VM and disk image backup! Handy Backup saves your Sharepoint data in native formats (unless you are using encryption), allowing you using these data to manual browsing, replicating, cloning or every other way copying this information to other places than its original. Feel free with your Sharepoint data copies! 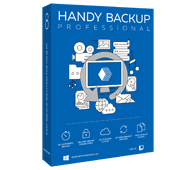 In addition to its primary advantages, Handy Backup has some useful features allowing you organizing Sharepoint backup and restore tasks in full automatic mode. Scheduling tasks for an exact time and repeating for a period from minutes to months. Starting missed tasks, as well as starting a task by an event such as user logon/logoff. Keeping different versions of the same backup dataset, with possible time stamps. Full, incremental, differential and mixed full/differential backup for any data type. 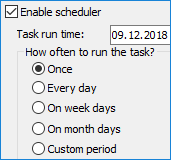 Starting other programs (including Sharepoint components) before or after some task. Used together or separately, these components can make a good Sharepoint backup configuration environment, to automate any particular data-saving task and integrate it into some already well-developed business process or data workflow. Protect your Sharepoint data with a Professional edition, allowing backing up both server Sharepoint components and end-user data such as Office 365 documents on many computers simultaneously! Free 30-days trial version! How to Back up Sharepoint Data Using Handy Backup? To make a task for Sharepoint backup Powershell scripts or user files, please use the “Database” plug-in available in any version of Handy Backup. Select this plug-in on a Step 2 of a new task wizard. You will find it in a “Database” section of the data source list on the left panel. Note: This plug-in requires an ODBC driver for Sharepoint added as a data source to the Windows data list. Please refer to the User Manual, where the procedure of sharing an ODBC driver described. 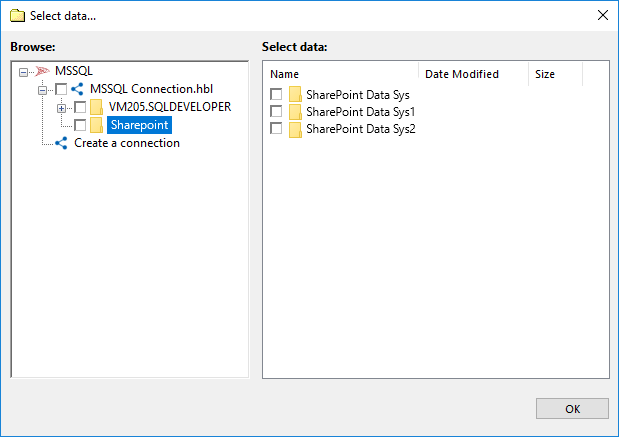 To access Sharepoint server-level information directly, you can use the “MSSQL” plug-in, allowing backup Sharepoint database without using an ODBC driver. 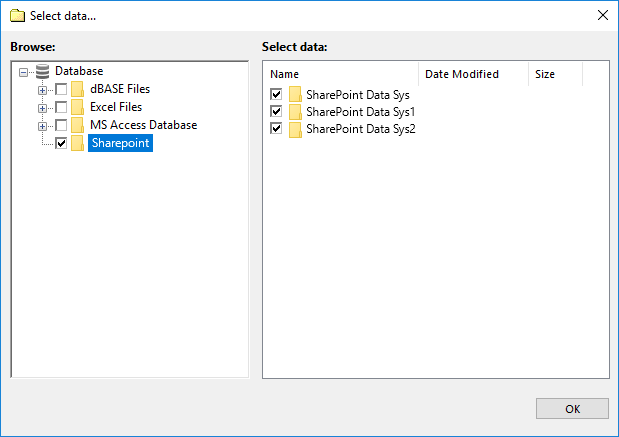 To use the MSSQL plug-in, find it in the “Database” source list on the Step 2, and then select all Sharepoint databases you need. You can create a restoration task for Sharepoint data, moving a restored copy to its original location or to another place. The last method allows also replicating and cloning any Sharepoint data to other PC or a server, preserving original formats and content. As Handy Backup stores all unencrypted data in native formats, you can easily organize granular restoration for Sharepoint data, either by selecting only part of data by Handy Backup task or by completing a manual restoration using any file manager! Add the extra layer of protection to your Sharepoint backup strategy, including Sharepoint to Handy Backup automating software. Try the possibilities by personal experience, downloading a latest full version of Handy Backup just now for a 30-days trial!